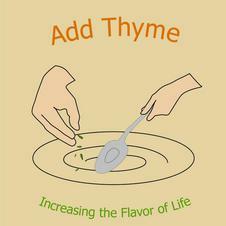 Add Thyme is about discovery. Cooking Events - Create great food in a fun and relaxed atmosphere. We offer interactive cooking classes limited to no more than 10 students per chef so you receive the personal attention you deserve. Classes are based on using fresh local organic ingredients, with an emphasis on technique to help you develop into a better cook. Tours - San Francisco is a unique and wonderful jewel of America we live and enjoy sharing with visitors. We conduct culinary walking tours and customized tours in English, Italian and German. Mick has always had a passion for food and cooking. His first culinary creation was a zucchini stuffed meatloaf at the age of 10. Before starting his culinary career he worked in finance as hedge fund trader in San Francisco. After completing his culinary training at Tante Marie's, with an internship at Incanto, he began working for Parties That Cook, leading corporate team building parties. He was Executive Chef for the Mountain Terrace of Woodside, and has worked with a number of Bay-Area caterers. He also taught cooking classes at Sur La Table, Kitchen on Fire and for private clients. Barbara loves desserts and is willing to travel far and wide in search of the best gelato, cookie or chocolate. She has been baking since the age of 5, and has been teaching and cooking since the age of 12. A frequent traveler to Europe, she loves to visit her family in Tuscany and friends in Puglia, Italy where she lived and worked for 2 years. In college she spent a year in Germany where she developed an appreciation for coffee and cake hour. Since 2003, she has been sharing her love of travel with others by conducting sightseeing and culinary tours. She taught cooking classes at Sur La Table in San Francisco, where she was Culinary Manager and Resident Chef for 8 years. She loves helping people discover new ways to appreciate food and culture.